Do you have dry skin and are looking for a moisturizing body wash? Using a hydrating body wash for treating dryness and flaky skin can play a huge role in how your skin looks and feels. It also reduces itchiness and makes the skin appear smoother and softer. These body washes are designed to not only clean your skin thoroughly but to also improve its texture and softness with regular use. Dry skin can be very uncomfortable if proper care is not taken in terms of skincare and these body washes work well in keeping the skin soft and supple. Available with a body lotion from the same range, this body wash from OGX is formulated with Marula oil that is a very good moisturizing ingredient for dry skin. The body wash comes in a convenient packaging and the quantity is good as one bottle lasts for 3-4 months if used daily. The consistency of the body wash is thick and it hydrates the skin instantly after one wash. The skin looks healthier and softer with regular use. The price of the body wash is moderate but you can get it at a discount online. Marula oil nourishes the skin and improves its moisture levels instantly. The body wash has a creamy consistency and lathers well on the skin. It has a very pleasant fragrance that lingers on the skin all day. The body wash can be a bit heavy for normal skin and can cause breakouts. The Marula oil is a bit sticky so it needs to be rinsed thoroughly. It is a very nourishing body wash and makes the skin feel soft and supple without causing any irritation. The formula is thick and creamy and the Marula oil helps in skin repair. Enriched with coconut milk, sandalwood extracts, Shea butter, and aloe vera, this body wash from SoapBox is available in three variants and is designed to nourish the skin cells at a deeper level. The body wash contains all natural ingredients and is free of parabens and other harsh chemicals. It comes in a pack of three and the quantity lasts for more than a year. The formula has a nutty and sweet fragrance. The price of the body wash is quite reasonable as compared to the formula. Shea butter and coconut milk hydrate the skin on a deeper level and reduce dryness from the first use. It has a nutty scent and is formulated without artificial chemicals. The body wash comes at an affordable price and the quantity is great. The fragrance of sandalwood might not suit every user. The body wash is not available in a single pack for ease of trial. It is a great body wash for very dry skin as it deeply moisturizes the skin cells and improves elasticity if used regularly. It contains all natural ingredients and reduces dryness with just a few washes. Designed for very dry and dull skin, the Olay body wash uses Shea butter to hydrate the skin and improve its texture. The body wash has a very rich formula and lathers a lot even with a small quantity. It feels luxurious on the skin and has a soothing scent. Regular use helps to soften rough skin and accelerate the cell renewal process. The quantity is good and one bottle lasts for 2-3 months if used daily. The body wash comes in a pack of three at a very affordable price. The body wash is immensely hydrating and lathers well with a small quantity. It comes in a pack of three at an affordable price and smells pleasant. It softens the skin significantly with just a few uses and prevents dryness from returning. The formula feels a bit heavy initially since it contains Shea butter. It is not available in a single pack or a smaller pack for travelling purposes. The Olay moisturizing body wash works wonders on dry skin and reduces roughness and flakiness by removing all dead skin cells and nourishing the skin at a deeper level. It is very affordable and has a soothing fragrance also. If you are looking for a mild body wash for itchy and dry skin, this formula from Dove is a good option to consider. It is designed to be ten times more nourishing as compared to regular body washes and is formulated without parabens, artificial fragrances, or chemical lathering agents. Regular use helps to reduce symptoms of psoriasis and eczema as the formula is very mild and gentle on the skin. The price of the body wash is a bit high but the mild and effective formula makes it worth it. The formula is very gentle on the skin and hydrates it very well after just one wash. The body wash reduces itchiness and controls symptoms of psoriasis and eczema. It comes in a convenient pump packaging and the quantity makes it worth the high price. The price of the body wash is higher than its counterparts. It can be a bit irritating for sensitive skin because of the added chemicals. This mild body wash from Dove improves the condition of the skin significantly and reduces dryness and itchiness with regular use. The packaging is convenient and it lathers well. Available in six variants and two sizes to choose from, this body wash from Dial is a bestseller from the brand because of its nourishing formula and affordable price. It is formulated with coconut milk and comes with a tropical scent. The texture of the body wash is very nourishing and it rinses easily from the skin leaving it soft and smooth. It is also suitable for sensitive skin and provides lasting hydration of up to 12 hours. The price of the body wash is reasonable as it comes in a pack of three. Coconut milk hydrates the skin without causing any irritation. The body wash has an uplifting scent and provides long-lasting hydration. It rinses easily and is suitable for dry and sensitive skin. The packaging is not very sturdy and can leak if not closed properly. It does not work on very dry skin that needs a lot of nourishment. The coconut milk-based formula of this body wash is very soothing and reduces skin irritation from the first wash itself. It comes in a pack of three and works very well on dry and sensitive skin. Enriched with soothing oatmeal, chamomile, and lavender extracts, this body wash from Aveeno is designed for sensitive and irritated dry skin. It has a calming formula that is infused with essential oils and is formulated without dyes and artificial lathering agents. The body wash comes in a standard bottle packaging and has a lavender scent. Oatmeal hydrates the skin and forms a gentle barrier to prevent moisture loss. The price of the body wash is high as compared to other variants. The soothing oatmeal and chamomile formula calms the skin and reduces dryness significantly. It is suitable for sensitive skin as well and comes with a pleasant lavender scent. The formula is infused with lavender and ylang ylang essential oils which uplift the senses. The body wash is a bit expensive because of the natural ingredients. The formula is a bit thick and can take some time to rinse off completely. This body wash from Aveeno provides great relief from dry and itchy skin and has a soothing formula that smells very pleasant. It is very gentle on the skin and contains no harsh chemicals that can dry out the skin further. Another great body wash from OGX for dry skin, this product comes at a very affordable price as compared to its other variant. It is a creamy body wash made with coconut oil that has multiple benefits for the skin. With 7 variants to choose from, this body wash also contains vanilla extracts that lend a tropical scent to the formula. Regular use helps to soften and nourish dry skin and makes the skin look supple and healthy. The price of the body wash is very affordable. The formula of this body wash is very creamy and is designed for very dry skin. Coconut oil leaves a protective layer on the skin and creates a moisture barrier. The body wash comes at a very affordable price as compared to its quantity. The formula can feel a bit heavy for people who prefer light body washes. It contains artificial lathering agents that might irritate sensitive skin. The extra creamy formula of this body wash makes the skin feel smooth after rinsing and protects it from further dryness. The price of this body wash is very affordable and the tropical coconut scent is an added advantage. 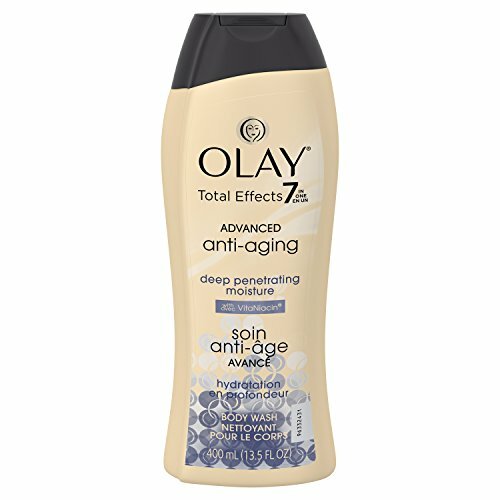 Available in two sizes, this hydrating body wash from Olay is designed for aging and dry skin as it has anti-aging benefits. It improves the elasticity of the skin and reduces fine lines caused by dryness. The formula contains vitamin E that is a hydrating ingredient and enhances the radiance of the skin. It lathers well and has a pleasant scent that lingers on the skin. The price of this body wash is moderate but you can buy a pack of multiple bottles to get some discount. It offers anti-aging benefits and is designed to penetrate deep into the skin. The formula reduces dryness and itching and makes the skin look youthful. It is available in multiple sizes so it is easier to try the product. The formula contains artificial chemicals that might not suit all skin types. The price of the body wash is higher than some other variants. It is a great option for dry and mature skin as it penetrates deep into the cells and reduces fine lines and dryness with its vitamin E-based formula. The body wash has a pleasant scent and lathers very well. 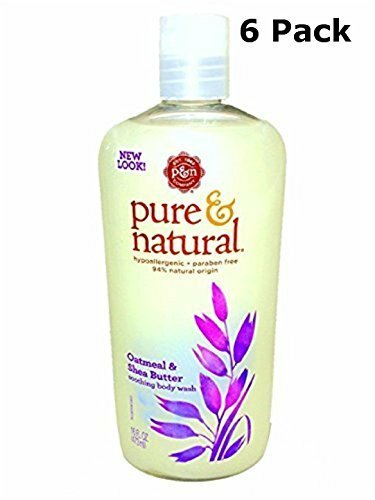 Formulated using soothing shea butter and oatmeal extracts, the Pure & Natural body wash contains 94% natural ingredients and is suitable for dry to normal skin. It has a light scent and is available in two size variants. Shea butter helps to nourish the skin and oatmeal soothes inflamed and itchy skin. The hypoallergenic formula does not break out the skin and rinses easily after wash. The price of the body wash is affordable as it comes in a pack of six bottles. It contains 94% natural ingredients and has a hypoallergenic formula. Shea butter and oatmeal provide a soothing effect to the skin and nourish it well. The light and clean scent of this body wash does not irritate the skin. The formula contains artificial dyes that might not suit sensitive skin. You need to buy multiple packs as this body wash is not available in single packs. The natural ingredients used in this body wash are very beneficial for dry skin and provide permanent relief from itchiness and dryness if used regularly. The lightweight formula is easy to use and does not leave any residue. Made with natural moisturizers, the Mountain Falls body wash has a rich and creamy consistency that nourishes and repairs the skin cells. It is available in four sizes and five variants to choose from. The body wash comes in a pack of three and the pump packaging makes it easy to use it. The formula gives a rich and foamy lather and has a very light scent that suits all skin types. The price of the body wash is reasonable. It is formulated with natural moisturizers that are gentle and nourishing. The multiple variants and size options offer something for every skin type. The formula produces a rich lather that feels luxurious on the skin. It contains some artificial lathering agents that might irritate sensitive skin. 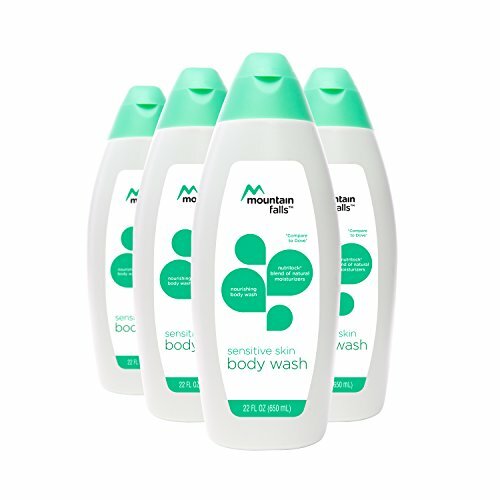 The body wash comes in a bulky packaging that is not travel-friendly. This body wash is a good option to consider as it works effectively on dry to very dry skin and contains natural moisturizers that repair the skin cells. The pump packaging makes it easy to use the body wash.
Use a soft loofah if you have dry skin as exfoliating loofahs can irritate the skin further. Do not rub the body wash very vigorously on the skin as dry skin can get itchy and flaky if proper care is not taken. Choose a body wash that contains more nourishing ingredients like shea butter, coconut milk, coconut oil, and vitamin E and avoid products that are filled with chemicals. Avoid buying products that have a strong fragrance if you have a sensitive dry skin. Rinse the body wash very thoroughly from the skin as the residue can cause further damage to the dry skin. Wait for some time before expecting visible results from a body wash for dry skin as it takes time to penetrate deeper into the skin and reduce dryness issues. Go for a body wash which comes with a pump packaging as it makes it easier to handle the bulky bottle. So these are the ten best body washes for dry skin which are formulated to reduce dryness and flakiness while working on the deeper layers of the skin. All these washes have a rich and creamy formula that works well for dry skin. These tips will help you find the right body wash for combating dryness and will make your skin look supple and nourished. Which is your favourite body wash for dry skin? Is it possible if I use a body wash instead of a shampoo? Both are different formula and purpose. Shampoos are made for specific hair conditions which contain ingredients for hair and not skin. Body wash is an emulsion of water and detergent base. Body wash contains gentle ingredients bases than shampoos with pH 5-6.5-balance to the skin. I wonder if Dove soap good for my dry skin? There are soap produced specially for dry skin including Dove. So, it’s recommended to people who have extremely dry skin. Moreover, Neutrogena, Aveeno Cleansing and more also good for dry skin. I suggest you to lean choose the product that suit to your skin type. Then, you’ll get best result. OGX Marula Oil Body Wash Moisturizing Body Wash works very well on my skin.